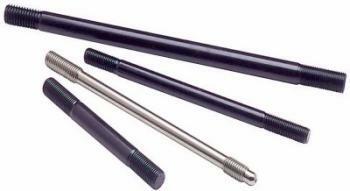 For openers, ARP uses a premium grade 8740 alloy that is rated far superior to “aircraft” quality. Each stud is placed vertically in special racks and precisely heat-treated to 200,000 psi. This procedure ensures complete heat penetration and the results are far superior to those lesser quality studs from other manufacturers who just dump pieces in a basket and hope for the best. You won’t find a better quality stud on the market from any other source. Look for ARP stamped on each stud as your assurance of quality. On many street-driven vehicles, where master cylinders and other items protrude into the engine compartment, it’s probably necessary to use head bolts so that the cylinder heads can be removed with the engine in the car. Studs also provide more accurate and consistent torque loading. Here’s why. When you use bolts to secure the head, the fastener is actually being “twisted” while it’s being torqued to the proper reading. Accordingly, the bolt is reacting to two different forces simultaneously. A stud should be installed in a “relaxed” mode – never crank it in tightly using a jammed nut. Built my SRT4 and used these, they worked beautifully and have held up to a ton of abuse.